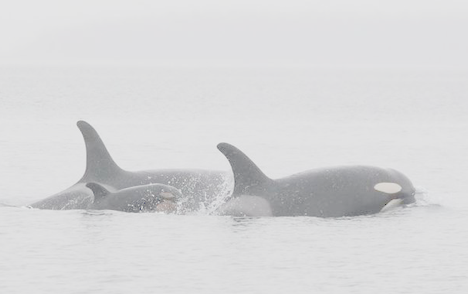 Southern Resident Killer Whales Need More Protection – Expanded Critical Habitat is Needed Now! NOAA Fisheries is the branch of the National Oceanic and Atmospheric Administration responsible for legal protection of marine life and the recovery of protected species. The Southern Resident orca (killer whale) were added to the Endangered Species List in 2005 after NOAA determined the population was in danger of extinction. While all orcas are still considered to be one species, Orcinus orca, there are ten known ecotypes that are ecologically unique. Each ecotype is further divided into unique populations that are typically genetically and acoustically separate. For this reason, the Southern Residents are considered a Distinct Population Segment. The Endangered Species Act mandates that NOAA Fisheries assign critical habitat for listed species or populations. Critical Habitat (http://www.fws.gov/midwest/endangered/saving/CriticalHabitatFactSheet.html) is a set of legally designated areas that are directly or indirectly necessary to conservation, based on the presence of certain biological or physical elements. These can be within or outside of the geographic range of the population in question. Critical habitat serves as a legal acknowledgement of environmental properties that are necessary to survival and long term recovery. NOAA can manage activities within these areas to prevent harm to the whales, or damage to the environmental features they depend on. For the Southern Residents, NOAA identified water quality, availability of prey species, and conditions for travel, resting and foraging as key environmental features. 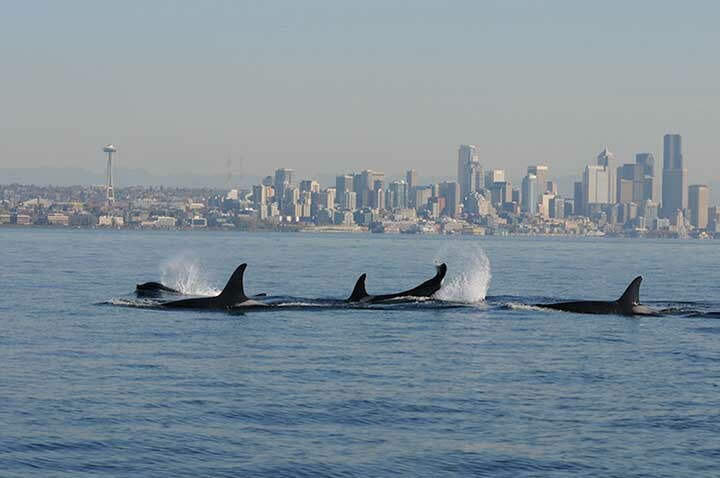 The current critical habitat includes about 2,560 square miles around the San Juan Islands, the Strait of Juan de Fuca and Puget Sound. Combined with Canada’s designated critical habitat, this covers the inland waters of the Salish Sea, where the Southern Residents are commonly seen from May to October. This does not include offshore areas, military sites or coastal waters less than 20ft deep. In order to designate critical habitat, federal agencies must clearly identify the physical and biological features necessary for individual survival and population growth. By fully understanding what aspects of the environment are essential, the agency can better manage human activity in a way that does the least harm to these features. Since 2005 and the initial listing of Southern Residents as endangered much has been learned about where they travel and what they need for survival. 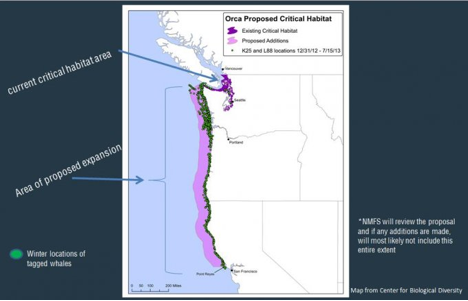 One of the major findings is that they range far outside the current critical habitat protections of today – in and around Puget Sound. In fact, 2 of the 3 pods (K and L pods) swim into the open ocean in late fall and hunt for food along most of the Pacific Coast from Washington to central California. This entire area was initially left out of the critical habitat designated following listing under the Endangered Species Act. Another newly learned requirement for survival is the issue of sound and noise within areas the whales feed and occupy. The phenomena of echolocation is the way the whales communicate among themselves, as well as to find and capture food – salmon mostly. In essence, the language the whales use is transmitted via sound waves through the water, and outside noises, like ship noise, naval sonar noise, or other interferences are counter-productive for whales, sometimes even deadly. On January 24, 2014, The Center for Biological Diversity petitioned NOAA Fisheries to expand the designated critical habitat. On February 24, 2015 NOAA agreed that revision was warranted. They are in the process of determining what the new critical habitat should include. We need to push them to move faster. The whales lives are at stake. That expansion would include a much broadened area along the coastline down to Point Reyes, just north of San Francisco. Additionally, the petition asked them to limit excessive noise within the entirety if the protected area. Both of these additions would be very helpful to the protection and recovery of the whales. In addition to being exposed to pollution and boat traffic, they are threatened by a decrease in prey. Salmon comprises 80-90% of their diet, unique among Orcas. Salmon numbers have declined throughout their entire range, and throughout the entire year. Unfortunately, NOAA has made little headway in recovering salmon in most of the northwest. There is ample opportunity for NOAA Fisheries to become more active relative to salmon restoration, including, but not limited to the Columbia & Snake Rivers, the Klamath River and the San Francisco Bay Delta systems in California. Historically, these three systems were the highest producers of salmon on the west coast. All have had extreme losses of historic wild salmon populations, and all now have Endangered Species Act (ESA) listed populations of salmon, and some have several populations that have gone extinct. Recovery of these salmon stocks is key to expanded critical habitat being supportive of recovery of the Southern Resident Killer Whales. The time is now to expand the Southern Residents’ critical habitat! If they are to survive and recover to healthy, self sustaining populations, they have to have the places they live and feed protected, reduced toxins in their waters, ample salmon as a food source, and reduced sound levels for communication. These whales are unique, beautiful and highly social animals. They are a key part of the marine environment. Our children and grandchildren will marvel at their sight, but only if they continue to exist. 2 Comments on Southern Resident Killer Whales Need More Protection – Expanded Critical Habitat is Needed Now! Please expand the Southern Residents critical habitat. All life whether on Land, in the Air, or under the Ocean, need human protection by giving them all space to roam free from homo sapient harms! We are at crisis because of constant human egotistical greedy exploitation of all life and even our home planet itself! Grow up people and become stewards for the good of all.